Art of Transit: Nice views on my flight from Ohio this morning. When not window-gazing, I was LOLing at “Deadpool 2,” which I highly recommend. 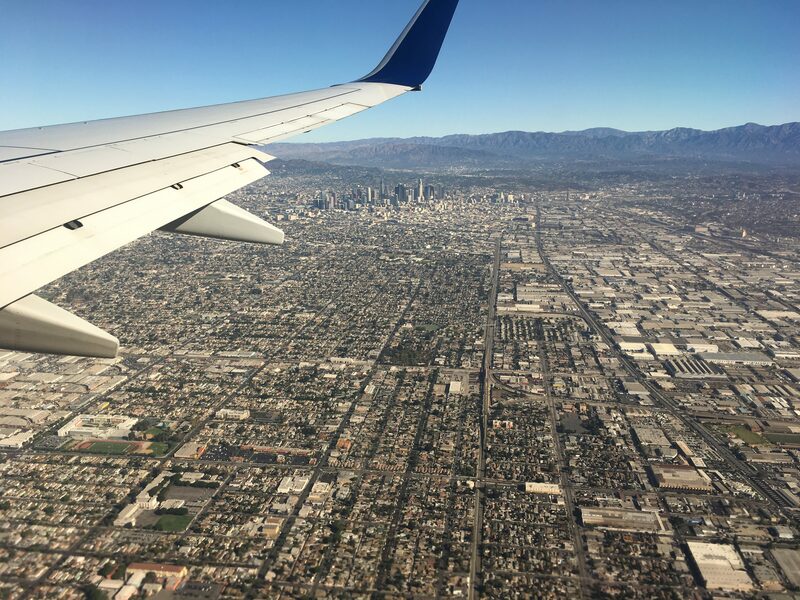 The Blue Line — just right of center — and Alameda Corridor and DTLA. 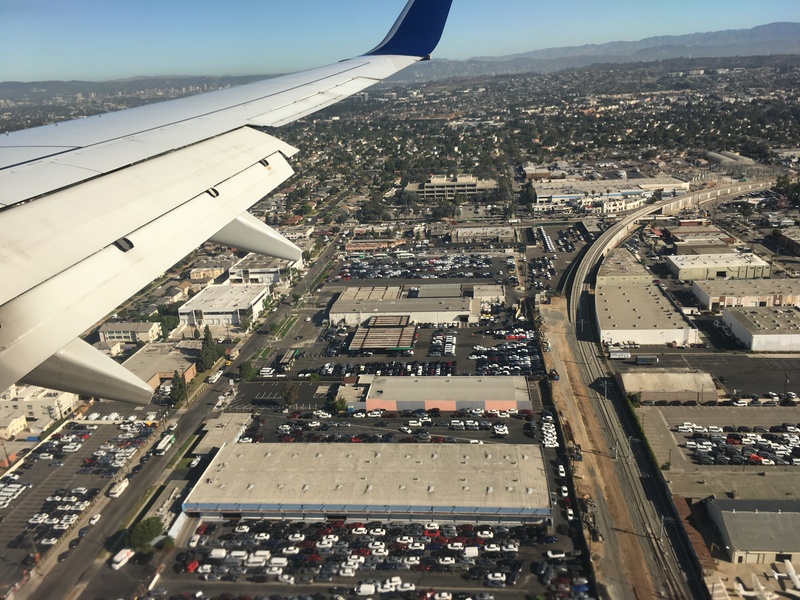 The new Crenshaw/LAX Line – just west of the north runway at LAX. The Winslow meteor crater in Arizona. Fun article, showing again that deploying fleets of scooters across our region is a lot easier said than done. What would make it easier? Places to ride them and park them other than sidewalks. The idea is to use the carpool lanes — and Metro’s ExpressLanes — to move more people. Electric car owners complain a powerful incentive to invest in clean vehicles is being lost. Thoughts? Subway leaders do not know for certain why the incidents have increased, though they speculate it may be in part because of the many homeless people who frequent the system or the ubiquity of expensive smartphones that drop to the tracks. Last year, only 43 of the incidents were believed to be suicides or attempted suicides, subway officials said, noting that it is often difficult to determine what motivates people. I don’t have numbers at the time for our system. But as followers of our @metrolaalerts know, we had a train-person incident this morning on the Red Line at Westlake/MacArthur Park. A reminder, once again, that outside the U.S. there are cities who don’t just talk the talk, but walk the walk when it comes to making transit accessible and comfortable, especially for families. The clean vehicle owners should not receive any incentives. Why should they clog up the carpool lanes? Ridiculous. They already receive Federal subsidies. It’s time to force the issue. Either there’s a market for clean vehicles or dump them. California will mandate clean vehicles in 30 years. That’s a horrible policy. Unfortunately, these are very expensive to install. In regards to the platform screen doors that Japan uses, Honolulu’s elevated rail line still under construction is also planning to used this safety feature on their station platforms, since their trains will be using an electrified third rail to power them (in fact, the platform screen doors were just constructed at their rail maintenance facility just west of Pearl Harbor. Currently, these doors are in use at Oahu, Hawaii’s Pearlridge mall monorail. 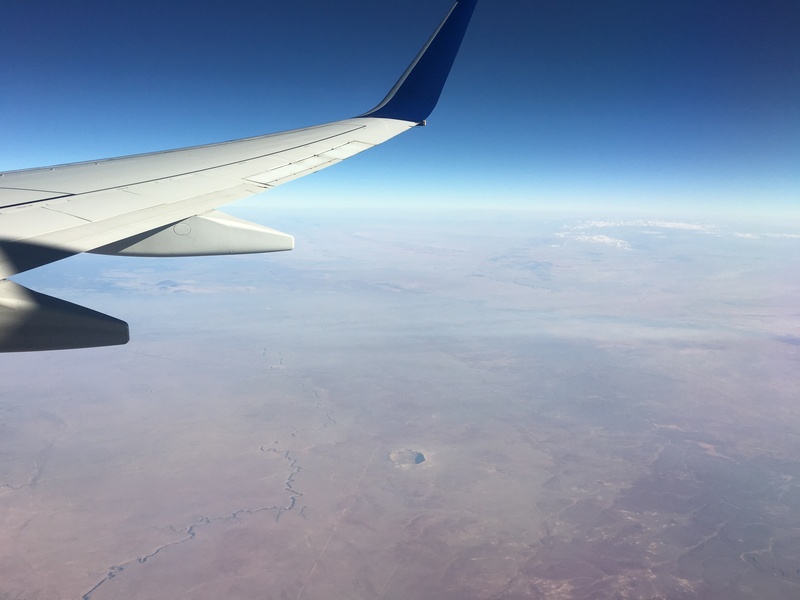 The crater is commonly called Meteor Crater. But, since there are many craters caused by meteors, scientist and others call it Barringer Crater. There are three kinds of train-person incidents: suicides, people intentionally entering the tracks, and people unintentionally entering the tracks. Metro’s primary concern should be the third kind. Make the floor slip-resistant, ensure that people stand back while the train is moving, etc. We should NOT spend tens of millions of dollars we don’t have to prevent people from entering the tracks to chase their phones. We do not do this at bus stops, crosswalks, or anywhere else. At some point, people simply need to take responsibility and not do things that will jeopardize their own lives. Steve, whenever the TBMs on the purple line start tunneling (I presume it’s being delayed for some politicians schedule coordination/ opening ceremony nonsense, unless there’s a legit technical reason?) will metro do what the Alaskan way viaduct did ? They had a website/ social media account where they updated weekly and you could see they’d mined 300 feet and installed so many rings that week and track the tunneling progress on a map. It was a neat way to follow the construction, metro should do the same. Later on they did the same things with the other tunnel systems that were installed behind the TBM. And with section 3 receiving its letter of no prejudice I assume we will have overlapping tunneling on section 3 and section 1 in about three years? Such a website would be a really good way to track progress of both achievements! The TBMS for the PLE already have their own Twitter account — https://twitter.com/ElsieSoyeonTBMs. As far as tunneling progress, we don’t have plans for a real-time map at this time but I’m glad to bring the subject up and see how we can issue frequent and accurate updates.